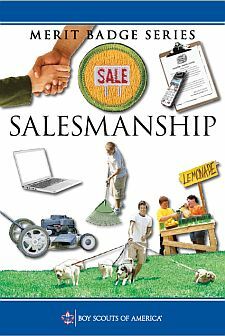 Explain the responsibilities of a salesperson, and how a salesperson serves customers and helps stimulate the economy. Explain the differences between a business-to-business salesperson and a consumer salesperson. Research the market to be sure the product or service meets the needs of customers. Learn all about the product or service to be sold. If possible, visit the location where the product is built and learn how it is constructed. If a service is being sold, learn about the benefits of the service to the customer. Follow up with customers after their purchase to confirm their satisfaction and discuss their concerns about the product or service. Help your unit raise funds through sales either of merchandise or of tickets to a Scout event. Sell your services such as lawn raking or mowing, pet watching, dog walking, show shoveling, and car washing to your neighbors. Follow up after the service has been completed and determine the customer’s satisfaction. Earn money through retail selling. What made the person choose sales as a profession? What are the most important things to remember when talking to customers? How is the product or service sold? How often is the owner approached by a sales representative? What good traits should a sales representative have? What habits should the sales representative avoid? What does the owner consider when deciding whether to establish an account with the sales representative? Include at least two of your own questions. Prepare a written statement of your qualifications and experience. Include relevant classes you have taken in school and merit badges you have earned. Discuss with your counselor what education, experience, or training you should obtain so you are prepared to serve in a sales position.